AL SECKEL is acknowledged as one of the world's leading authorities on illusions. He has given invited lectures on illusions at Caltech, Harvard, MIT, Berkeley, Oxford University, University of Cambridge, UCLA, UCSD, University of Lund, University of Utrecht, and many other fine institutions. 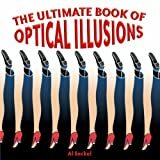 Seckel is currently under contract with the Brain and Cognitive Division of the MIT Press to author a comprehensive treatise on illusions, perception, and cognitive science. Seckel has established international relationships with the leading researchers, magicians, and artists who specialize in illusions. These relationships have allowed Seckel to amass the world's largest collection of illusions. Seckel has been involved in the creation of all of the material currently offered by IllusionWorks. He is also putting together the world's largest exhibition on illusions, which will have its premier at the Science Museum, London and simultaneously in a mirror site at the Science Museum of Western Virginia, in the Fall of 2001. The two sites will then travel to 15 domestic venues and simultaneously in 15 UK and continental venues. The exhibition consists of three sections: The first is a very large assemblage of interactive physical interactives, where the user can manipulate various key parameters in each illusion, thereby seeing in a very dramatic way the hidden constraints of the perceptual system. The exhibition will not just be centering on optical effects, but also examing other sensory illusions, including cross-modal interactions, where one sensory input, such as an auditory cue, can dramatically change another perceptual sense, such as vision. These effects are very powerful and are not generally known, especially since so much new material is being presented. The second section will consist of original artworks and sculptures from the world's leading illusion artists. The third section consists of themed environments, such as an Ames Room, tilted house, Crazy street, etc. "Illusions are a very nice window into how the brain perceives, because they can reveal the hidden constraints of the visual system in a way that normal perceptual processes do not. Illusions also contain the elements of joy and surprise, which makes their presentation pleasing to both young and old alike."